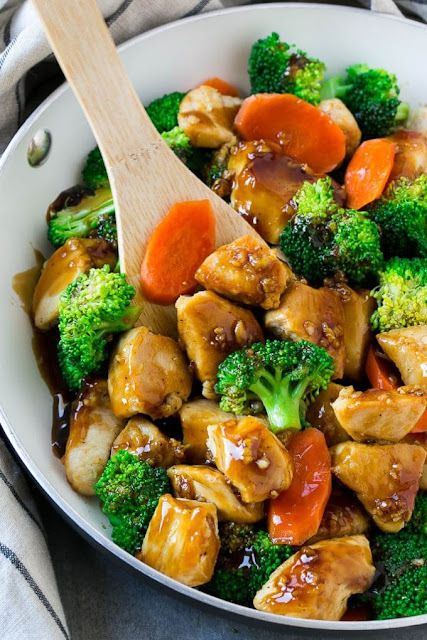 This "Honey Garlic Chicken Stir Fry" recipe is full of chicken, broccoli and carrots , all coated inthe easiest sweet and savory sauce . This is a healthier dinner option . And i am sure yor family will really love it . Today I’ve got a honey garlic chicken version that’s quick, healthy and incredibly easy to make! I love that you can customize the meat and veggies exactly to your liking, and the honey garlic chicken sauce only has 4 ingredients. Heat 1 teaspoon of oil in a large pan over medium heat. Add the broccoli and carrots and cook for approximately 4 minutes or until vegetables are tender. Wipe the pan clean with a paper towel and turn the heat to high. Add the remaining tablespoon of oil. In a bowl whisk together the chicken broth, honey and soy sauce. In a small bowl mix the cornstarch with a tablespoon of cold water. Pour the soy sauce mixture over the chicken and vegetables; cook for 30 seconds. Add the cornstarch and bring to a boil; cook for 1 more minute or until sauce has just started to thicken.